Chobe National Park, is the second largest national park in Botswana which covers some 11 700 square kilometers, has some of the greatest concentrations of game found on the African continent, not least of which are the 120 000 head of elephant. The Chobe National Park is surprisingly diverse, as it has the perennial Chobe River as its Northern border, and it touches the Linyanti marshes to the west, is home to the well-known Savute Channel, and connects with the Moremi Wildlife Reserve to the South West. 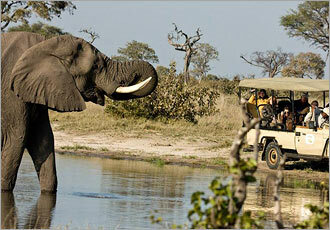 Chobe is most often associated with its elephant population as this has the largest elephant population in the world. The great attraction with this area is you have the opportunity to go on a river safari and a traditional game drive safari each day, and to get close to an elephant in a boat and vehicle is awe-inspiring. 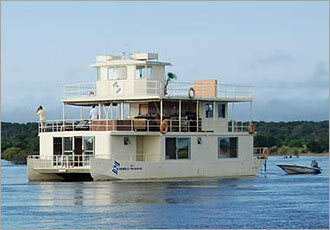 Another stunning experience is to spend a few days on a luxury house boat and follow the animals along the Chobe and Zambezi Rivers. Go Safari will arrange you a 3 or 4 day safari to the animal rich Chobe area either from Johannesburg but the best option is to go from Victoria Falls as this is only a 45 minute drive away. The ideal way is to spend 3 days in Chobe and then go to Livingstone (Zambia) to experience Victoria Falls for another 3 days. There are cost effective daily flights between Johannesburg and Livingstone. Open guest areas, a secluded hide, refreshing swimming pool and 20 ‘meru styled’ tents complete the lodge which lies beneath a forest of sturdy knob thorns. It is within these tree tops that the largest colony of white back vultures occurs. The lodge is unique for several reasons and amongst these is the fact that it is situated within a game rich reserve affording the guests wonderful sightings between our open Landover safaris into the Chobe and boat cruises along the Chobe River. 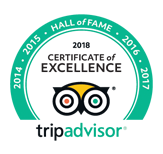 The lodge is also situated on a route which the elephants take between Zimbabwe and Botswana. 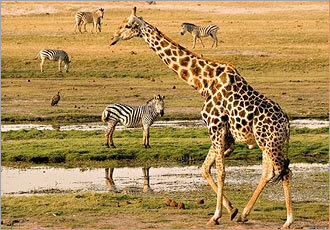 You will enjoy the river safari in the morning and the game drive in the afternoon. During the morning the river is distinctly less busy with fewer boats. This also permits a longer experience, assuming that sightings keep us busy, and we do not have to cut the trip short to get back before sunset. It does also permit a greater length of the river to be explored. 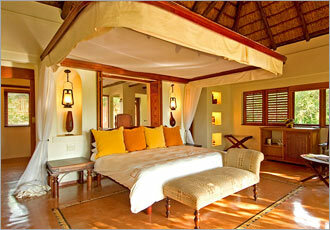 Let Go SAfari design a Chobe / Vic Falls holiday for you!